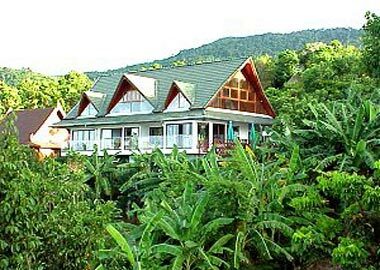 The guesthouse is located on a hill, above Bang Por beach, in an exclusive residential area with security guards. From there you have a splendid view of the gulf of Thailand, Koh Pangan, and the Ang Thong national marine park. The house has 5 guestrooms, all with sea view, air condition, fridge, sitting area, and bathroom. In the cosy common area you will find a TV and a DVD-player. Internet access is possible via wireless-stick. The very nice pool with its big, furnished deck invites to relax or have a sunbath. The small, partly covered outside-restaurant offers Thai- and German dishes. The breakfast, which is included in the room price, will also be served here. Axel and his wife Jaroay will take care of you while you are on site and are happy to assist if you want to book Samui excursions, vehicles and so on.